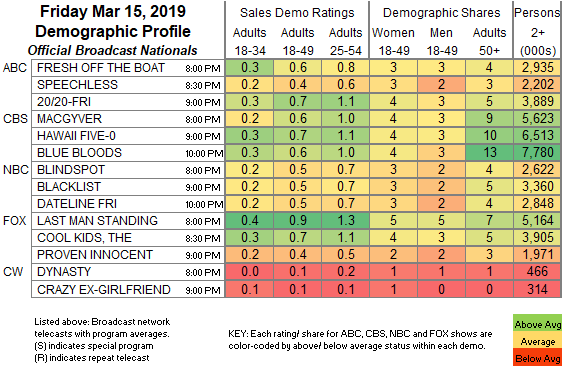 NETWORK FINALS: CBS had a bad night in adjustments (possibly due in part to local preemptions for College Basketball division tournaments), with BLUE BLOODS down 0.2, and both MACGYVER and HAWAII 5-0 down 0.1. In addition, SPEECHLESS lost 0.1 in final numbers. CABLE HIGHLIGHTS: It was a big College Basketball day on ESPN, including ACC TOURNAMENT games at 1.54 (Duke vs. North Carolina)/0.54 (Florida State vs. Virginia), a PAC-12 TOURNAMENT game at 0.50, and SEC TOURNAMENT games at 0.24/0.21. Discovery’s GOLD RUSH dropped 0.08 to 0.61, with the lead-out hour down a tenth to 0.48, and the lead-in hour at 0.27. HGTV’s MY LOTTERY DREAM HOUSE gained 0.03 to 0.32. HBO’s REAL TIME WITH BILL MAHER rose 0.05 to 0.31. Food Network’s DINERS, DRIVE-INS & DIVES ticked up to 0.27. 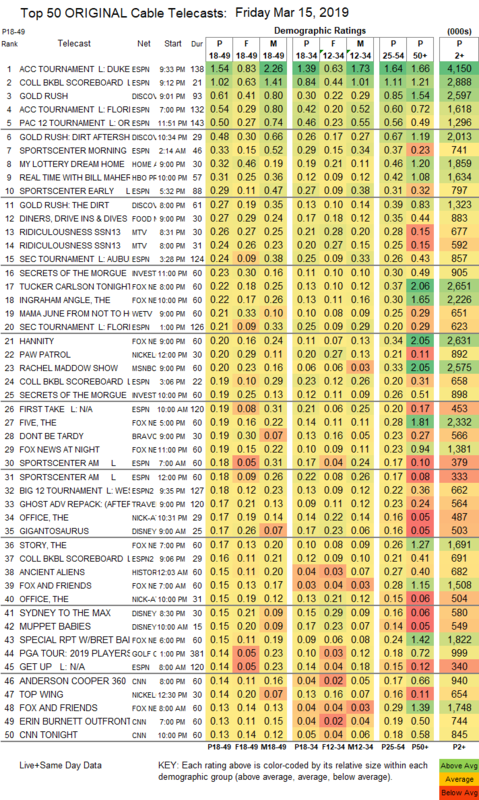 MTV’s RIDICULOUSNESS was at 0.26/0.24. ID’s SECRETS OF THE MORGUE was at 0.23/0.19, compared to last week’s 0.22/0.20. Fox News’s TUCKER CARLSON TONIGHT led cable news at 0.22/0.37/2.7M, with MSNBC’s RACHEL MADDOW SHOW at 0.20/0.33/2.6M, and CNN’s ANDERSON COOPER 360 at 0.14/0.17/900K. On We, MAMA JUNE: FROM NOT TO HOT returned at 0.21, and BRIDEZILLAS returned at 0.10. Bravo’s DON’T BE TARDY was steady at 0.19. Paramount’s I AM RICHARD PRYOR documentary was at 0.10. Cinemax’s STRIKE BACK was steady off the chart at 0.03/127K.